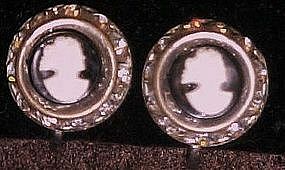 Here is an older pair of cameo earrings with a screw back. White on black cameo surrounded by a ring of clear rhinestones. measures 5/8" in diameter. All stones intact and in great condition. Unsigned, with no makers marks.